I am a Questbridge Scholar and match, but I never visited before arriving. I ranked W&L because of its location and size. The post-grad success rate was incredibly important for me, as well. What made you decide on your major/minor? I decided on political science before arriving at W&L. My interests were tailored by a previous Capitol Hill internship I experienced when I was 12. I was bitten by the D.C. bug and never looked back. Tell us about any interesting summer or Spring Term opportunities you have had while you’ve been at W&L. So far, I have been fortunate enough to have internships each summer. After my first year, I was able to intern on Capitol Hill again, under U.S. Rep. A. Donald McEachin, D-Virginia. The next summer, I worked for the Securities Industry and Financial Markets Association (SIFMA), a trade association in D.C. It was a wonderfully balanced experience for me as it served as a transition into the finance sector from the D.C. scene. This summer, I am very excited to be heading to Palo Alto, California, to work as a Summer Analyst at Makena Capital Management. How has your experience as president of the Student Association for Black Unity (SABU) enriched your time at W&L? My experience as SABU president has been very rewarding. The role does a terrific job of holding me accountable. My experience has allowed me to self-reflect on how to better engage my peers and generate a more united community. My first two years at W&L, I was a bit more boxed off and secluded in my leadership roles. My leadership philosophy is to work from the inside out. In order to truly make a difference in my community, I had to self-reflect. Serving as SABU president has made me more social and has allowed me to understand that generating genuine relationships with all students stands as the best way to promote campus progress. Lastly, the role makes me feel indebted to W&L’s people of color. While self-reflecting to offer up my best leadership, being president has taught me to never conceal my helping hands. What has been meaningful about your involvement with Alpha Phi Alpha? I am a spring ’17 initiate of the Xi Delta chapter of Alpha Phi Alpha. I am also the current president of the chapter. Since Xi Delta is a joint chapter seated at James Madison University, I am exposed to a wide variety of students and faculty. What I cherish most about my contributions since joining is the exposure it’s giving students on campus. Many students were never aware of black Greek life, and I felt a duty to educate my peers. How did it feel to be asked to represent Chavis House, which is named for W&L’s first African-American student, Rev. John Chavis? When Dean Tammy Futrell reached out to me this summer about the house, I was thrilled. W&L faculty and staff have always been wonderful in supporting the birth of black Greek life on campus. Chavis House served as a factor of social legitimization for Alpha and I’m just blessed to be a part of the process. Several alumni, Lex McGriff ’18 and Truth Iyiewuare ’18, immediately began mentoring me when I was a first-year student. Faculty and staff have also been very supportive. Dean Futrell, Dean Tammi Simpson, Dean Sidney Evans, Dean John Jensen, Kelsey Goodwin and many others. The list doesn’t end! Each one of these individuals is absolutely amazing at supporting and empowering people of this community and that’s what they do for me! I would tell any prospective W&L student to come in with a plan of attack. That’s not to say that you should know what you’re going to major in, but rather be open to all paths. Coming to Washington and Lee is like being dropped into a pool of opportunities. Recognize the great position you are in early so that you’ll be prepared later. 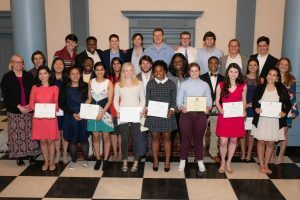 These opportunities (grants, scholarships, fellowships, connections, etc.) are extremely useful, and the quicker you are exposed to them, the better you will be positioned upon graduation. For a prospective person of color the opportunities are definitely present, but coming in with a sharp plan will also expedite your journey in finding yourself on campus and finding your post-grad career purpose. Discomfort can either drive you crazy or to success. I want to transition into the financial sector before pursuing a MBA. Favorite W&L memory so far? Each year SABU hosts a MLK basketball tournament and those are usually very memorable for me.